“In order to obtain an idea of the whereabouts of things in general, and the hills and valleys of Dartmoor in particular, we shall ascend Brent Hill, where granite once more gives place to trap. It rises to an elevation of 1,027 feet above the sea-level. It is a stiff climb to the summit, where will be seen the scanty remains of a thirteenth-century chapel, erected, it is said, by the monks of Buckfast, the then owners of the manor of Brent. 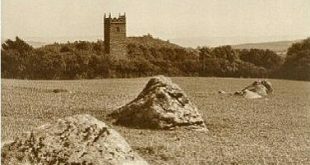 A different origin for these ruins appears in notes to Carrington’s ‘Dartmoor.’ He says that on the summit of ‘South Brent Tor’ there were large stones attributed to the Druids, and by some supposed to be the remains of a military station used in later periods as a beacon. In the dreadful storm of November 1824, they were blown down and scattered far apart from each other.” – J. Ll. W. Page, p.251. So writes the nineteenth topographical author John Lloyd Warden Page who visited Brent Hill sometime during the late 1800s. He is correct on several points, yes it’s a stiff climb, yes there are the remains of a chapel and nearly yes with a height of 1,027 feet (actually 1,020 feet). Then there is a ‘maybe’, possibly some folk may have referred to the hill as South Brent Tor although in general this is not the case. Then there are a couple of; “the computer says no,” definitely there are no large stones which could have any connection with the Druids, this was trend amongst the early antiquarians whereby many rock formations were ‘attributed’ to them. With regards to the ‘military station’ there have been many suggestions regarding this idea along with a few others. For instance a watch tower, a beacon and a windmill, all of which have provided no firm evidence apart from general references. However, what Page did omit to mention were the remains of what has been deemed to be an Early Iron Age fort. So lets wander back to the Early Iron Age earthworks and see what they have left us. If back then you wanted to build a strong defensible hill fort then Brent Hill would be the ideal place. Described as once having a strong defensive situation comprising of steep, rocky slopes on the north western side and a comparatively steep slope on the south eastern side. The defences on the crest of the hill consisted of a scarped bank on the south eastern side with traces of an inner slope which would have protected the more vulnerable aspect of the fort. A combination of banks and the natural slopes of the hill almost completely encompass the hill top. The date of the hillfort has been suggested as belonging to the Early Iron Age and its purpose being one of a defensive nature, Pastscape Record, online source HERE. Eventually the hillfort of the pagan ‘Men of Iron’ gave way to a Christian edifice in the form of a small chapel. In 1374 the register of Bishop Brantyngham of Exeter the following appeared: “die mensis ejusdem, Dominus concessit Licenciam Abbati Bukfestrie, quod possit in singulis Festis Sancti Michaelis, necnon in Majoribus Festis, in Capella sua de Brentedone...” Hingeston Randolph, p.341. In layman terms this was a licence to build a chapel dedicated to St. Michael on Brent Hill which later was to be the site of the famous Brent Fair (permission for which had previously been granted by Edward III in 1350). Tradition would have us believe that during a storm the chapel was destroyed in 1777 by a lightening strike. A later sketch of 1781 supposedly shows a folly had been built on the site of the chapel as a memorial to its previous existence. This too suffered at the hands of the Dartmoor weather and was also destroyed by another storm in 1824. Today all that can be seen of the chapel is: “a rectangular building measuring 6m long by 3.5m wide internally, with upstanding masonry walls to the north and east of up to 0.9m wide and 1.5m high, elsewhere the walls and internal structures are preserved as buried features. The walls are constructed from mortared rubble faced with trimmed and dressed granite blocks. Part of a window splay is visible in the east wall and a 0.9m wide door opening is traceable on the ground in the south west corner. At some distance to the south lies a small block of detached masonry”. Historic England, online source HERE. It has been suggested that the; “small block of detached masonry,” referred to once belonged to the folly. A photograph taken in 1941 of the chapel ruins now sits in the Dartmoor Archives website and can be seen HERE. Hoskins also considered that; “just above the village on the summit (of Brent Hill) are the ruins of a windmill, built about 1790.” p.347. However, this idea has now been discounted by several authors although a newspaper report of 1935 stated: “About the year 1790, apparently a Nicholas Tripe, a surgeon of eccentric habits, built a large house at the head of East Street, Ashburton. From his bedroom in the early morning he could see the dark summit of Brent Hill etched against the sky, and he ordered that a windmill should be erected. The disturbed meanderings of his visual sense could rest in peace as it followed the capricious torque produced by the wind upon that exposed height.” – The Western Morning News, Saturday 20th July, 1935. The settlement name of South Brent was first documented in the Domesday Book of 1086 when it simply appeared as Brenta. Eikwall suggests that the place-name derived fro the Old English word – Brant meaning steep. This may well refer to the steep eminence of nearby Brent Hill. p.63. So as we have a ‘steep’ hill it should come as no surprise that the hill has been associated with the location of a beacon fire. In the various churchwardens accounts from Dartington (1591, 1628, and 1690) there are entries of contributions paid for the maintenance of a beacon. Additionally in the accounts of 1591 funds were provided for the construction of a small house in which a watchman utilised. There is the possibility that this structure had been incorporated into the old chapel, evidence for which no longer exists. As can be seen above on Donn’s map of 1765 Brent Hill is marked as ‘Brent Beacon’. An earlier map of 1675 drawn by Ogilby also names Brent Hill as Brent Beacon. Despite such documentary and cartographic evidence some authors refute that any fire beacon existed on Brent Hill which I find hard to understand, just because there is no evidence today of such a structure it does not mean it was never there. What is certain is that Brent Hill has belonged to several chains of beacon fires lit to celebrate various coronations and jubilees in more recent times. One such occasion was Queen Victoria’s Golden Jubilee in 1887 when: “At about 9.15 a torchlight procession was formed, containing about four dozen torches, and,headed by the band proceeded to Brent Hill. The torches were distinctly visible from Rattery and Ugborough Hill and the winding procession formed an effective spectacle. On the summit of the hill was found Major Daubenny and Mr. Cornish-Bowden, J.P. Major Daubenny and Mr. Gerald Carew let off a quantity of good rockets and other fireworks of which they bore the expense. Mr. Conran, at the appointed time, lit the bonfire and in less than two minutes, one dare not venture within 20 yards of the flaming mass. When the fire was lit the band played one verse of the National Anthem, and the people joined in the singing. After spending about an hour watching surrounding fires, of which more than 50 could be counted. Mr. Harris proposes “Three cheers for the Queen” as a finish up to a most pleasant day’s enjoyment.” – The Totnes Times and Devon News, July 2nd, 1887. Eikwall, E. 1980. The Concise Oxford Dictionary of English Place-Names. Oxford: The Claredon Press. Hingeston Randolph, F. C. 1901. The Regisister of Bishop Brantyngham. London: George Bell & Sons. Hoskins, W. G. 2003. Devon. Chichester: Phillimore & Co. Ltd.